OSHA is on fire! Breaking news! WOW! Ok now that we’ve got that out of our system… We don’t usually have many changes out there when it comes to OSHA standards but there are some industry changing updates coming that will change a lot of things. Cages will not be required on fixed ladders after mid November of 2018. 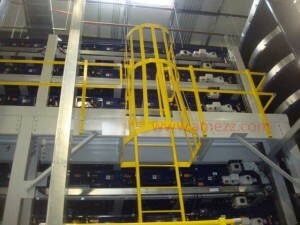 Currently, under OSHA standard 1910.27 cages are required on ladders where the climbs are over 20’h. 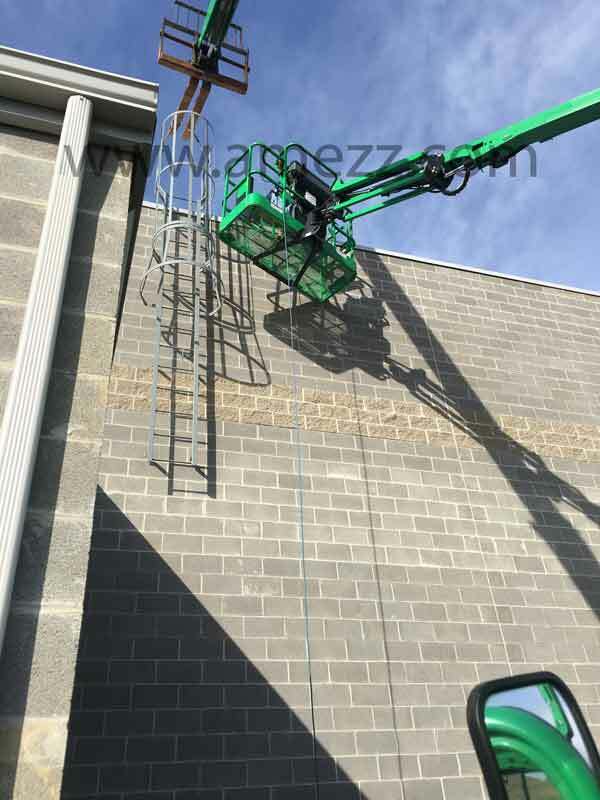 In OSHA’s new standard (OSHA standard 1910.28) taking effect 11/19/2018, ladders will not be required to have fall protection until their height is over 24’ (24’-0-1/4” requires fall protection). OSHA will also be requiring ladders installed after 11/18/2018 to have fall protection in the form of a personal fall arrest system or ladder safety system (not a cage). If you have cages now, don’t worry, you will be grandfathered in for twenty years. So, why the change? OSHA is aligning the fixed ladder standard to be more in line with the ANSI standard A14.3, which in 1979 changed its fall protection height requirement from 20’ to 24’. Why are they telling us now when the rule won’t go into effect until 11/19/2018? OSHA wants to give the industry time to update products and procedures before they go fine crazy. You CAN now follow the new OSHA rule 1910.28 even though it is not in effect yet. You would not be meeting the current OSHA standard, but you would be in compliance with the future OSHA standard. OSHA would consider this a “de minimis violation”. De minimis violations are violations of standards which have no direct or immediate relationship to safety or health, and do not result in a citation, or penalty and need not be abated. How does this help you? Well, if your floor to floor height is between 20’ and 24’, you will no longer need to have a cage on your ladder. First off, this can save you LOTS of money. Why? 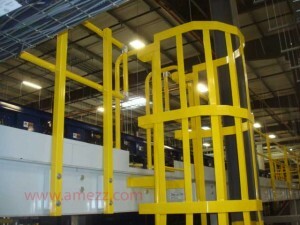 Not only is it easier to fabricate an uncaged ladder, but there is less steel involved in making the ladder, and also, due to the size a caged ladder takes up on a truck compared to an uncaged ladder, caged ladders can cost 2-4 times as much to ship than their uncaged counterparts. Another advantage of losing the cage is that you decrease its visibility from the roadside. 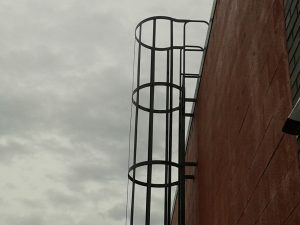 Without the large cage the ladder is tougher to see from a distance, increasing your buildings visual appeal as well as decreasing the chance that kids looking for a cool place to skateboard, copper thieves, and other people you don’t want on your roof will see the ladder as they pass. 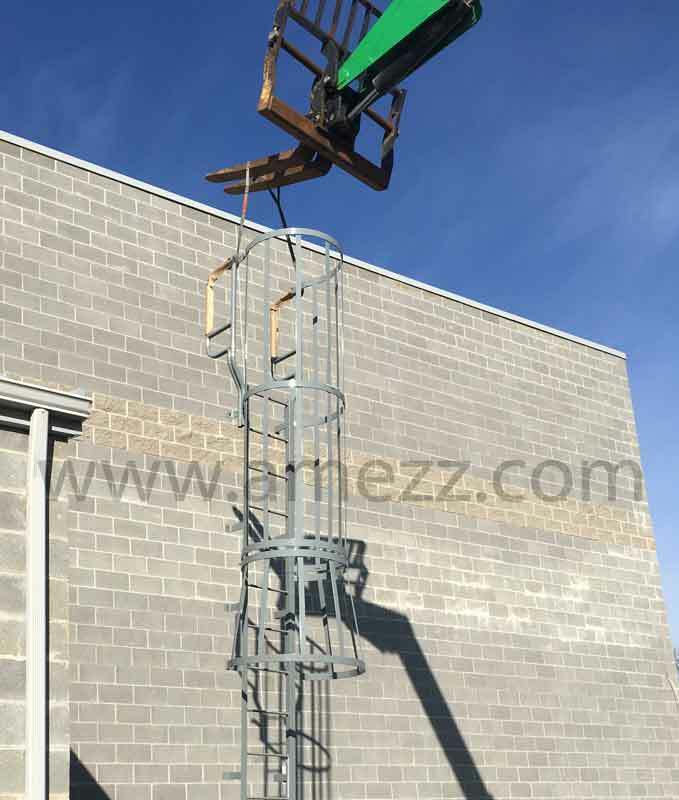 All this being said, when OSHA’s standard mandated cages on climbs over 20’, A-Mezz still offered cages on ladders that only had a climb of 10’ or so and we will continue to offer cages for customers who prefer the added safety of a cage for those shorter climbs. We have gotten feedback from many customers who prefer having a ladder cage because that safety barrier is always in place. You can’t forget to bring a harness with a cage so safety is increased. 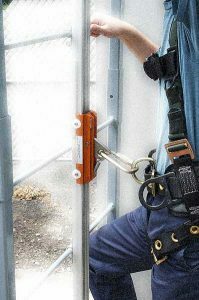 It is the same argument that makes ladder safety gates so popular and efficient as opposed to ladder chains. Chains only work if the person before you closed them. Ladder safety gates are always in place, always swing closed and always protect you. The same goes for a fixed ladder cage which adds some protection for climbers regardless of whether they have a ladder harness or not. 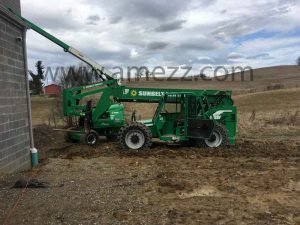 This entry was posted in ladders, safety tips and tagged ladder, OSHA, safety tips on January 31, 2017 by Brett. A customer called asking for a safe and secure means of accessing their roof and us to do a fixed ladder installation. 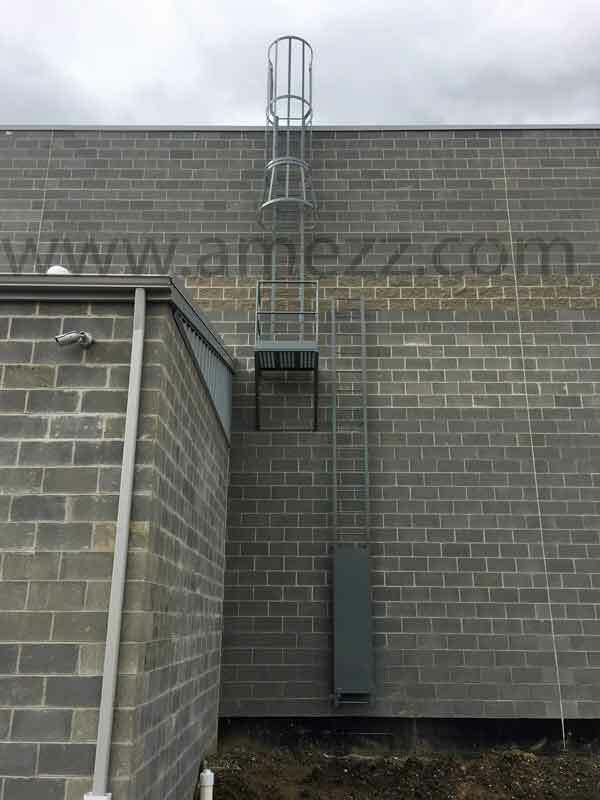 They have a building that has multiple tenants and didn’t want to have to go through the tenants’ space every time roof access was needed, so an interior ladder and roof hatch combination was off the table. This happens more often than not either because they don’t have a good location inside to mount the ladder or they don’t want to make a hole in their roof. We went out for a preliminary site visit to verify what the job would entail. The location that was chosen to mount that ladder at was flat from floor to roof. 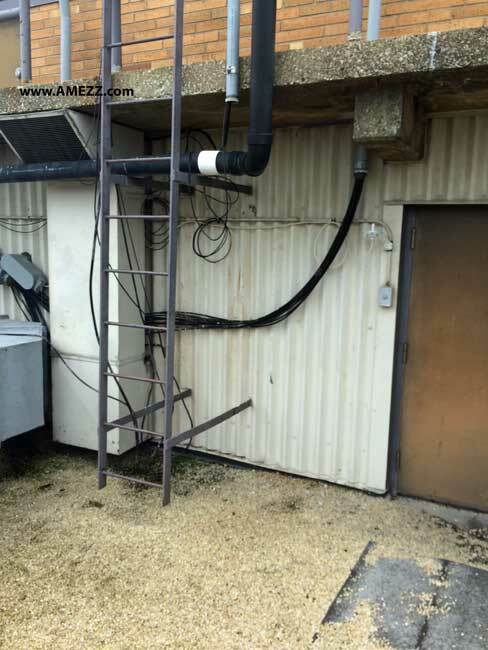 There were no gutters so we would not have to worry about having to either start and stop the gutter and add another down spout, or add a step across platform at the top of the ladder to keep within OSHA’s requirement of a maximum step across a distance of 12”. There was a slight parapet at the top of the wall so we set up the extension ladders to verify that the parapet was under 14”high so we would not need to have a crossover ladder with return on the back. 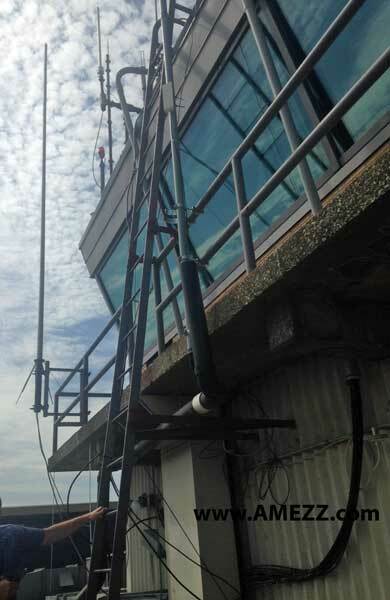 We did elect to modify the walk through handrail to remove the return down to the roof to allow more flexibility with installation. Using the self supported walk through handrail allowed a proper fit regardless of the parapet thickness. Materials were fabricated and shipped to the jobsite where the installation crew attached the lower and upper ladder sections together with the supplied brackets. Next, the ladder was hooked up and elevated into place by a forklift boom. By securing the ladder a little lower than the top, but well past the weight ½ way point, we were able to safely use a shorter, readily available lift and avoid the added cost of additional machine rental. 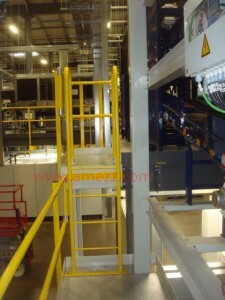 The ladder was also outfitted with the LG6 6’ security ladder rung guard to prevent unauthorized access to the ladder. Once hoisted into place, ½” sleeve anchors were inserted into holes drilled into the block and turned until expanded properly, securing the ladder to the wall. For this ladder 18 anchors were used, distributing the 650# ladder and 300# capacity load to well below the tension and shear values for sleeve anchors with the recommended 1-7/8” minimum embedment and a 4:1 (25%) safety factor. Installation was completed in just one morning by a crew of two. 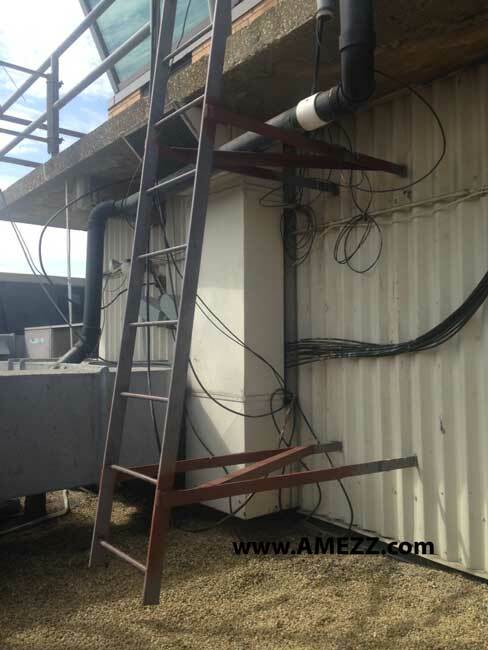 This entry was posted in installation, ladders and tagged construction stairs, installation, ladder, OSHA on October 26, 2016 by Brett. We recently were called out to look at a ladder that did not meet OSHA standards (1910.27) for clearance on the back side of the ladder. 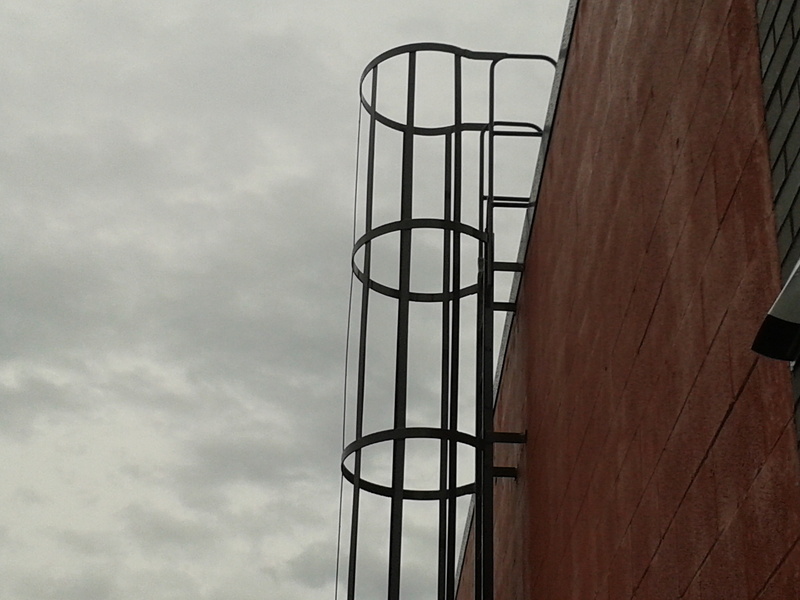 The ladder also had two angles of climb as shown in the above photo. 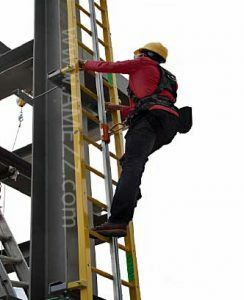 When climbing up the ladder, the concrete walk was too close to the ladder for you to safely grasp the rung and also to put your foot on the rung while climbing. The ladder was accessing the top of the traffic control tower at an airport, and as such, we had to work around a variety of factors to ensure a proper replacement or modification of the ladder could take place without interrupting operations. As the install location was at an airport, the use of a crane to bring a replacement ladder to location would have been a logistical nightmare. We decided that whatever the solution was, it was to be brought up from the inside of the tower. Our first option was to remove the ladder and replace it with a 90 degree ladder. That is the most common fixed ladder type. There were, however, issues with supplying a replacement ladder. First off, the concrete walk and rail were extended beyond the top of the tower. This meant that our replacement ladder would need to be very far from the structure in order to give us the required 7” clearance behind the ladder at the concrete walk location. That is not a deal breaker, but holding so far off the structure would have also required an extra-long crossover to reach the tower roof. OSHA allows the ladder to have a maximum 12” step across at the top of the ladder. As the ladder has to stand 7” off of the wall (or the furthest obstruction off the wall) you can get by without a step across platform if the obstruction is 5” or under (5+7=12). The replacement ladder would have been very large. 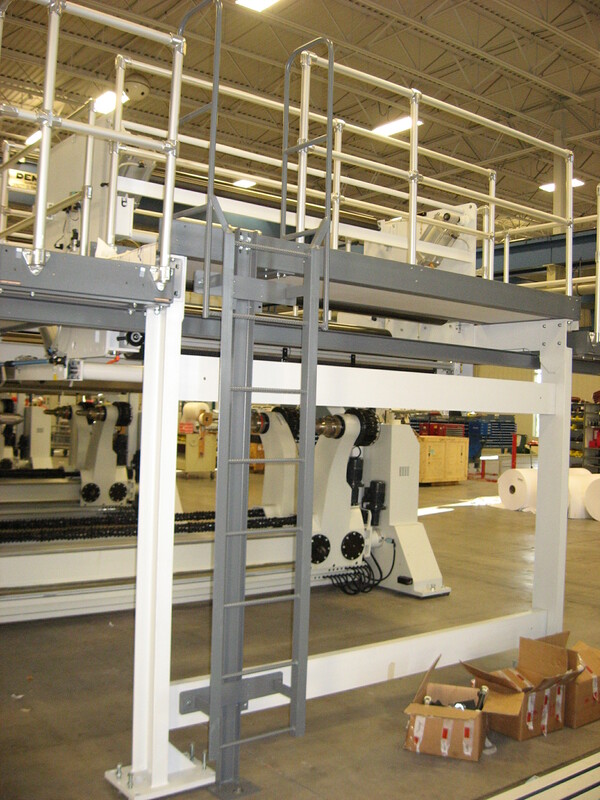 Ordinarily, this too can be dealt with by using our modular line. 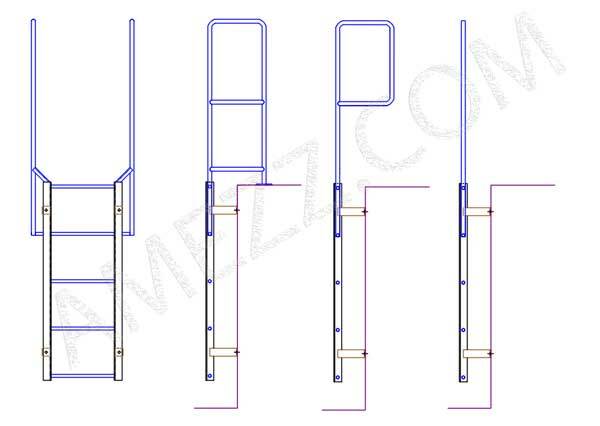 Our Modular Fixed Ladders come in pieces no larger than 7’L. 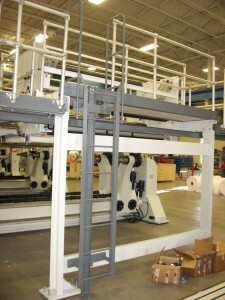 Each ladder section bolts to the next one and has a pair of standoff brackets before and after the splice. We could not accommodate additional standoff brackets required by the modular design so we would have needed to weld each splice together. Again, this was not a deal breaker either, but it did make this option less economical than other options. We decided that it was more economical to modify the existing ladder. The top of the ladder was already angled at an 81 degree angle. In the field we ran a laser down the ladder from the top to see where we would land if we kept that same angle throughout the climbing run. By cutting the ladder at the bend, and then cutting each of the lower standoff brackets, we were able to gain close to a foot of clearance at the concrete landing, well within the acceptable tolerances of OSHA’s standards. This option was not without its challenges though. As the ladder was going to be sticking off the wall even further than before, we were concerned about having a stable climb. Here is the original ladder with the standoff brackets back to the structure. We added cross bracing across the two standoff brackets to stiffen the ladder up with the extended bracket length. After modifying the ladder, the bottom rung was still within the 14” allowed by ANSI A14.3, so no additional ladder rungs were required. Each welded location was then sanded down to remove any sharp edges or burrs and painted with a rust inhibiting primer. The end user was going to have their maintenance department repaint the ladder after completion of the work to help cut down on costs. The ladder modification was completed at budget and within the scheduled time. Most importantly, the customer now had safe access to their roof. If you have a unique situation like this, give us a call. We can help you come up with the solution that fits your site requirements and budget, too. 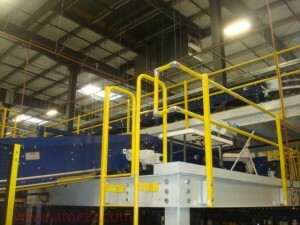 This entry was posted in ladders and tagged custom fabrications, ladder, maintenance, OSHA, safety tips on November 20, 2015 by Brett. Do I Need a Swing Gate on My Fixed Ladder? 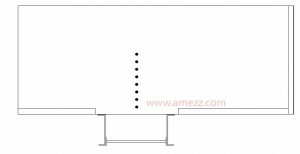 This means that every ladder opening needs to be either (a) Offset so that a person cannot walk (or fall) directly into the opening or (b) Protected by a ladder safety gate. It is an easy either/or. The most common ladder installation locations are not offset and as such require safety gates. 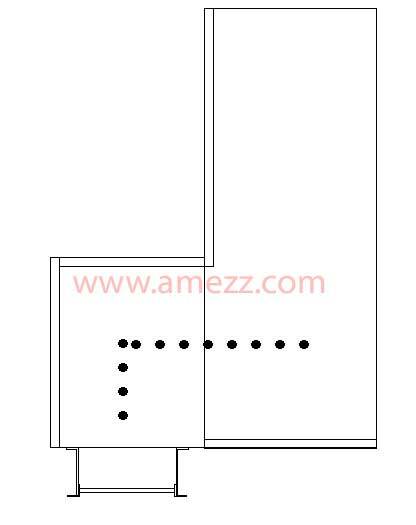 Below you will see some photos of ladders and top view sketches clarifying why each of their orientations either do or do not require a gate. Many people had been incorrectly interpreting this believing that if their ladder opening was under 4’h, a gate was not required. 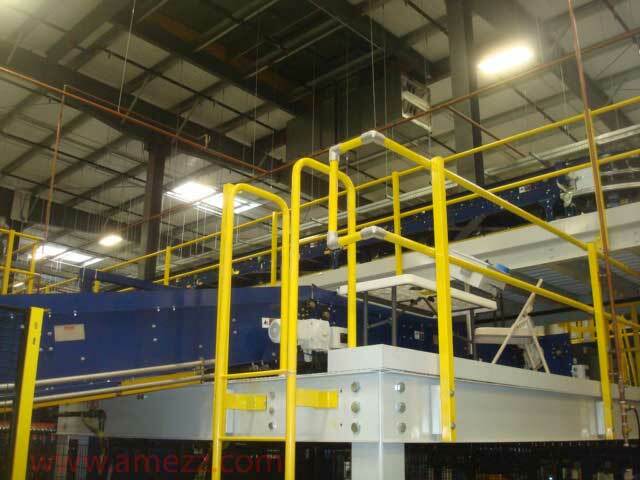 OSHA has cleared up this misconception by stating “Unguarded ladderway floor openings and unguarded ladderway entrances on all surfaces should be cited under section 1910.23(a)(2)”, for all intents and purposes, if you have a ladder opening, it is required to meet OSHA 1910.23(a)(2). Now that we know what the code requirement is, it is time to review a few common ladder mounting orientations to discuss where they fall under the code. The above fixed ladder is mounted onto the side of the platform. Work is performed further down the platform but it is possible to fall directly down the ladder opening. This location is not offset and as such would require a swing gate. See the below top view sketch for clarification. 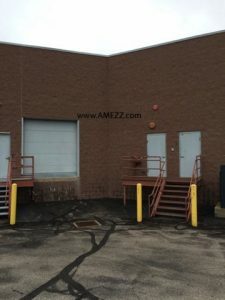 You can walk directly to the ladder opening from where work is/can be expected to be performed and as such, a safety gate is required at the ladder opening. 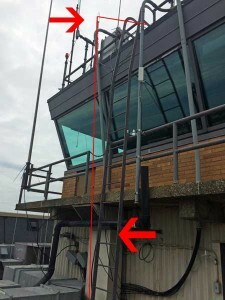 The above ladder accesses a platform and then turns to access the main walkway. 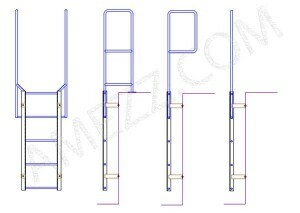 This ladder is offset and would not require a swing gate at the opening. 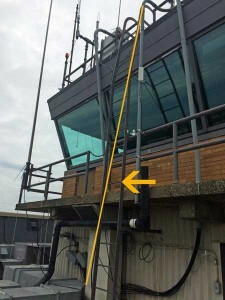 As you can see above, if someone fell while at the main walkway they would fall onto the ladder landing surface, they would not fall down the ladder opening. 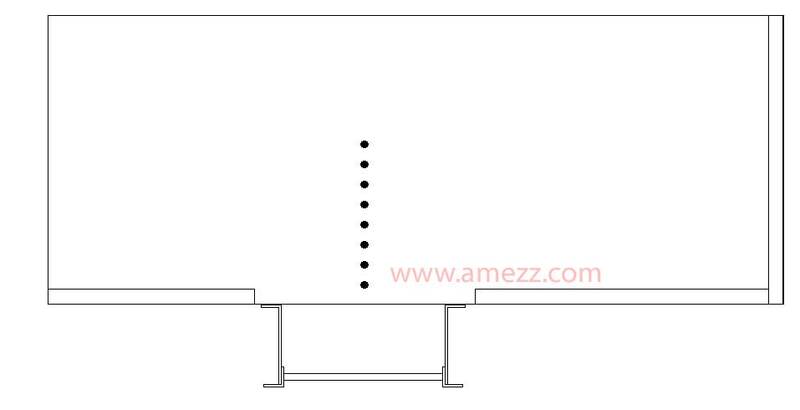 If the ladder was rotated to the left side of the landing it would require a safety gate because then the ladder opening would no longer be offset. Above is a very common ladder mount position. 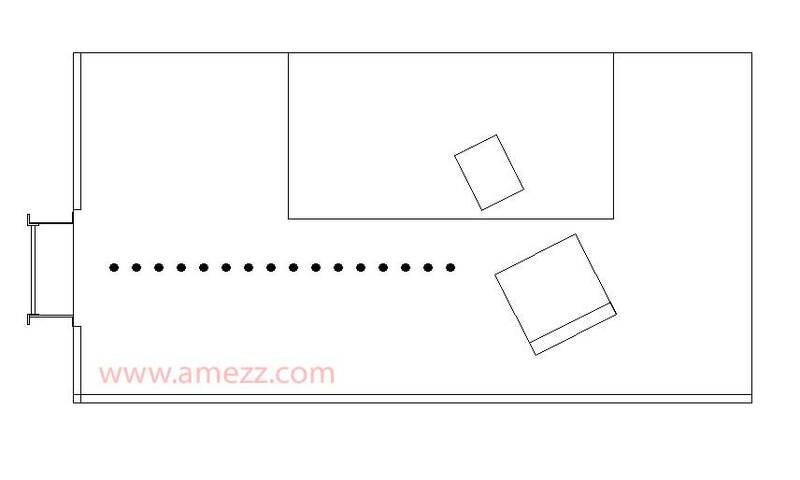 This one can be tricky until you lay it out from the top view. From first glance it looks like because the ladder is off to the side that it would be offset from the normal flow of traffic, but if you fell at that point of the catwalk there would be no guarding to protect you. A swing gate is a requirement at this location. As you can see from the above sketch, there is a single direction of travel to the ladder from the catwalk. This is not offset. 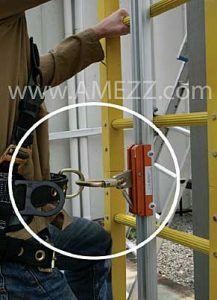 It would be a single direction fall into the ladder opening and as such, a ladder safety gate is required to protect your employees when a ladder is installed in the above orientation. Most areas are not offset. A good rule of thumb is that if you can fall into the ladder opening with a single direction fall, then you are not offset. The only example above that didn’t need a gate was the second ladder location. With that orientation, you would fall onto the ladder landing and then hit the rear railing, not fall through the ladder opening. 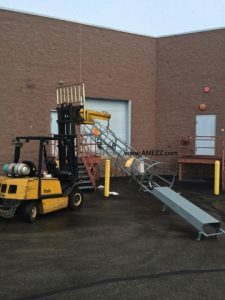 This entry was posted in ladders, Safety Gates, safety tips and tagged Handrails, installation, ladder, OSHA, safety gates, safety tips on August 31, 2015 by Brett. Stay safe out there everyone. I know that the above was just a random accident but if there is the chance that you can prevent those, especially after hearing about what can happen, why wouldn’t you? Taking precautions and doing things the safe and right way may take a little longer or cost a little more, but going home to our loved ones at the end of the day is worth any price. Our sincere condolences are with this customer and their family and hopefully sharing this story will cause someone else to take a moment to look around and make sure they are taking all necessary safety precautions. If you are unsure if you are doing something right, ask someone. With a little help we can all make it home safe tonight. This entry was posted in ladders, safety tips and tagged ladder, maintenance, safety tips on August 3, 2015 by Brett. 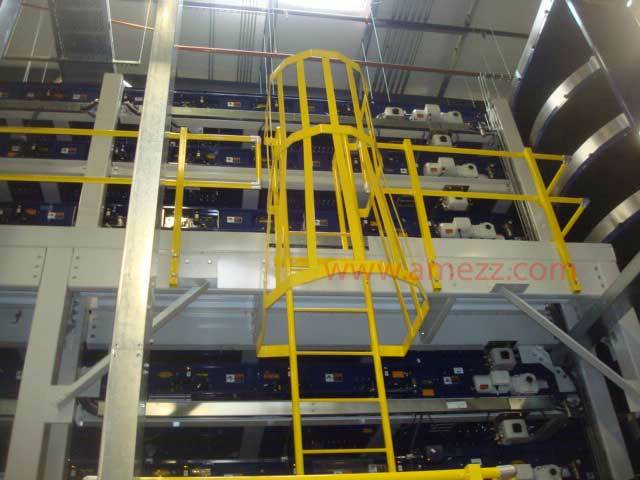 We supplied the above permanent ladder to a customer who was accessing elevated sections of their presses with catwalk platforms. 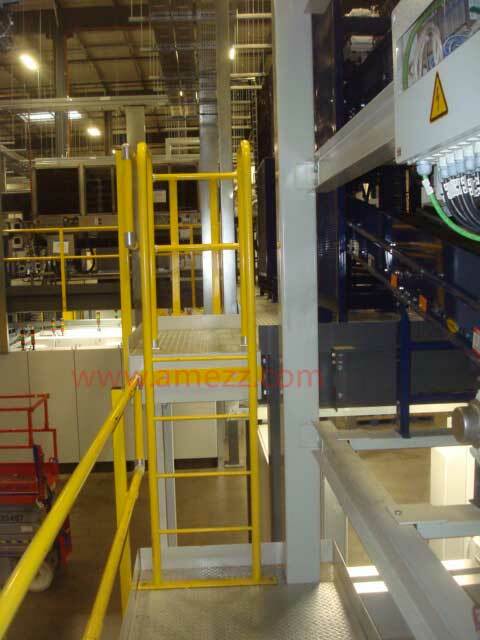 As the top landings for the presses were infrequently accessed, and floor space was minimal, using a fixed ladder with a walk through handrail was the best solution due to its small footprint, safe access and low cost. 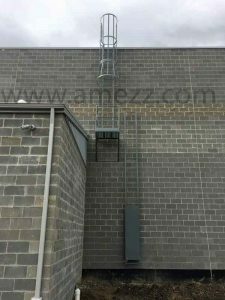 Our standard fixed 8 rung ladders have two pairs of standoff brackets to mount to the wall, but because there was no wall to mount the ladder to in this instance, the installer fabricated custom plates for the wall mount brackets to bolt to. Those custom brackets then mounted to the single C-channel running behind the access ladder. 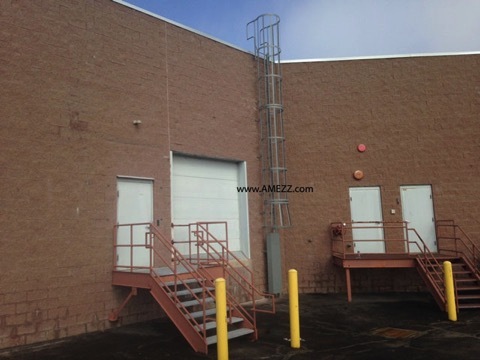 There are two main instances that you would find a ladder without the walk through handrails. The first is when you are stepping off to the side of the access ladder to exit (right or left hand exit). 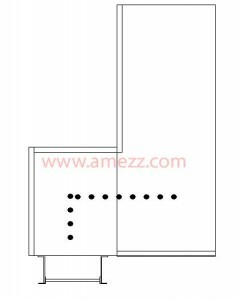 Keep in mind that when doing a side exit off your permanently fixed ladder you will still need to have four additional ladder rungs above the landing surface to meet the 42” extension, you wouldn’t just omit the rungs from the extension. Those additional ladder rungs would be for hand hold only. 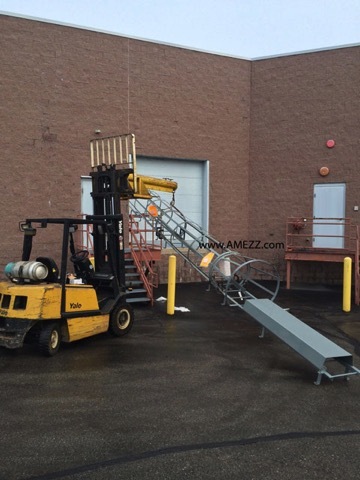 This entry was posted in ladders and tagged ladder on October 14, 2014 by Brett.